A Multimeter is a device which measures three parameters that are Voltage, Current and Resistance. It is used by Electrical Technician to perform a wide range of works such as repairing for appliances, maintenance work, Field Service Work etc. There are two types of Multimeter available in the market (a) Digital Multimeter, (b) Analog Multimeter. Digital Multimeter has a display which shows the measured value of Voltage, Current and Resistance in numeric form and in some advanced digital multimeter, you will see graphical bars also. On the other hand, Analog Multimeter has a moving pointer which shows the measured value of Voltage, Current and Resistance. Nowadays, Digital Multimeter is preferred because it shows more precise and correct value as compared to the Analog Multimeter. Infact, we will also recommend you to refer Digital Multimeter so that you can get more accurate measured value. We are sharing the description of 10 Best Multimeters on this page and hope the information will be beneficial for you. The Multimeter has a large digital display with backlit LCD which will help you get the visibility in dim light areas. It has the sampling speed of 2 times per secondalong with Overload Protection on all ranges. The company that is AstroAI provides a 1-year warranty on the product. 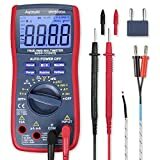 So if you are looking for an everyday use Multimeter then this product is best for you. There is inbuilt kickstand using which you can place the device hands-free and perform your work easily by using your both hands. It is a Manual Multimeter wherein you have to configure the device as per your requirement. It is handy and the user can operate it to perform different functions such as measuring AC/DC Voltage, DC Current, Resistance, testing of Diode and Transistor. Overload Display: ‘1’ is displayed. Sampling Speed: 2 times per second. Max. Display: 1999, 3 1/2 digits. For your information, this Multimeter has been awarded as Best Cheap Multimeter. This is a UL certified device which can solve the automotive and household electrical problems accurately and safely. It has large digital display and color LED for the battery check. With Innova 3320 Auto ranging Digital Multimeter, it is not required to dial in the correct range at the time of making the electronic measurement. Rubber Protection is available at the corners of the Multimeter which will protect it from any damage. 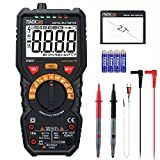 If you are looking for a budget product than this is the best multimeter When the device would not be in use than its Auto-Shut Off feature will turn off the device to save the remaining battery for further use. This Multimeter comes with LED and sound warning to alert the user when incorrect jacks are used. The user can set the value manually or its auto-ranging function will adjust the values automatically. It has been awarded as Best Multimeter for the money so you can expect that this small unit is best in less price. Its back-lit LCD display will show the measured value of Voltage, Current and Resistance. The company Mastech provides a 1-year warranty on the product so that the product can be repaired for free if damaged. You will get accurate & precise value and the construction of Mastech MS8268 Series Digital Multimeter is great. Etekcity Digital Clamp Multimeter is an auto-ranging clamp multimeter which can be used to measure AC Voltage, DC Voltage, AC Current and can perform Diode & Continuity test. The large LCD display shows the precise and accurate measured value of the different parameters. The company Eteckcity provides 1-year warranty and lifetime support to the product. The clamp available in the multimeter can measure AC Current in conductor up to 26 mm without interrupting the circuit. The measurement speed of the device is good as it updates 3 times in a second. If the multimeter is not in use then it will automatically enter into the sleep mode after 15 minutes in order to save the energy. It comes with a carry pouch which is perfect for use if you are moving from one place to another. The best part of this device is it can hold the data so you can refer to it whenever required. This multimeter unit is safe and the battery life is also good to perform the all-day activity. Track life Advanced Digital Multimeter can measure DC voltage of up to 1000 volts and AC voltage up to 750 volts. It is a perfect smart tool to measure to solve the daily problems as it has the feature to automatically identify the range of AC/DC voltage, AC/DC Current, Resistance, Continuity, Frequency, Transistor, Capacitance, Temperature, and measurement function. Its large LED display which is equipped with LED backlight & flashlight allows the user to take the reading in dim light. The data hold function helps in the effective measurement and has the True RMS – 6000 counts. 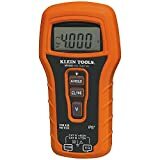 You will get a high precision value through this multimeter and supports the auto power off feature for the conservation of energy when not in use. It is incorporated with NCV Detection feature in which when you are testing above 12 volts than 2 lights will light up, when testing 40 volts than 4 green lights will light up and when testing with 80 volts all lights will light up with beep sound. Track life offers 2 years warranty so if any quality problem happens in warranty period then it will be repaired for free. This multimeter is a good product and is available at such a price which will match your budget. Klein MM500 Auto Ranging Multimeter has been awarded as Best Multimeter for Electronics Basics. It is a dustproof, waterproof device which can handle up to 10-foot drops. It is a durable product which is very handy and easy to use. This multimeter has an auto-ranging feature so you don’t need to set the values manually. The device has LCD display which shows accurate measurement in all application because of True RMS. The resistance range of the Multimeter is 4000 ohm. The multimeter comes with Category IV safety rating for 600 volts. 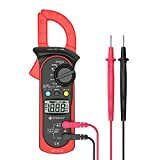 This is the best cheapest multimeter available in the market. Extech EX330 Autoranging Mini Multimeter can be used for testing of current, capacitance, frequency, diode, duty, cycle, resistance, voltage, and continuity. It comes with in-built non-contact AC Voltage detector which is the best feature of this multimeter. It can measure AC/DC voltage up to 600 volts with 0.5% basic accuracy, AC/DC current to 10 amperes. Extech EX330 Autoranging Mini Multimeter performs diode testing and continuity testing. There is a large LED display which shows the accurate and precise value of the different parameter. To alert the user, an audible beeper is available along with red LED indicator and low battery indicator. It offers total 12 functions including duty cycle, frequency cycle, and temperature. The display shows digits up to 4000 counts. The thermometer with Type K probe in multimeter can easily convert Fahrenheit reading into Celsius reading. Fluke 117 HVAC Multimeter has the ability to take the measurement of Microamp and Temperature. This multimeter has the ability to repair the HVAC equipment and flame sensors. It comes with a built-in thermometer for HVAC application and the Low input Impedance helps in preventing the false reading due to ghosts voltage. The users can take this device to test Resistance, Capacitance, Continuity, and Frequency. It can be used using one hand because it has a compact ergonomic design for one-handed operation. The multimeter has a large white LED backlight so that the user can work in poor lit areas. The device is totally safe and is rated in safety Category III 600 volts. The multimeters from Fluke are the favorite of the technicians and hence it has been awarded as Overall Best Multimeter for Professional Award. The cost of this multimeter is quite high but the product quality is amazing and provides an accurate reading. In this multimeter, you can switch off the Auto Ranging feature if you wish to enter the value manually during your work. It is incorporated with low pass filter which adjusts the speed drives and provides the accurate frequency measurement. This device is best for solving the issues, safely and conveniently. Fluke has added selectable Filter & True-RMS which provides accurate voltage and hence the device is responsive & reliable. Fluke 87-V Digital Multimeter is accurate to 0.05% DC and can measure 0 Amp. To 20 Amp. for 30 seconds and 1000 volts AC/DC. The large LCD backlit display provides the data easily and has a sleep mode which increases the battery life. The best thing is the product comes with Life Time Warranty so you would not have to worry about repair in case if the product got damaged. The device has been tested for safe use in CAT III 1000 Volts, CAT IV 600 Volts environments. It is a digital multimeter which has the capability to measure AC/DC Current, AC/DC Voltage, Resistance, Capacitance, Temperature and Frequency. The multimeter is awarded as Best Automotive Multimeter because it is very much helpful to troubleshooting the automotive problems. It is incorporated with Auto Ranging as well as Manual Ranging Mode so that user can adjust the values as per the requirement. It can measure the pulse width in Milliseconds for fuel injector & has an in-built thermometer which gives the temperature reading without using an external device. The device is also capable of measuring RPM with inductive pickup & cam measure AC/DC Voltage up to 1000 volts, AC/DC Current up to 10 amperes (20 amp for maximum 30 seconds), frequency to 200 kilohertz, resistance to 50 megaohms, capacitance up to 9,999 microfarads, temperature from 200 to +1090 degree Celsius & can perform continuity test as well as diode test. The digital display has a bright backlight so that the user can read the values in low light conditions. This Multimeter is safety rated for Category III up to 1000 volts & Category IV up to 600 volts. It can withstand the high voltage spikes in excess of 8,000 volts to reduce the risk of a surge due to faults in the circuit. The battery installed in it is of 9 volts and has a life of 400 hours without backlight and sleep mode is also available to maximize the battery life. If you are looking for Multimeter then you are in the right place. On this page, you can check the best 10 Multimeters popular around. A multimeter is a necessary device for those who are involved in electrical jobs. Without multimeter, you cannot perform the task easily and it will be very much difficult to get the values of the important parameters such as Voltage, Current and Resistance. The description and specification of 10 most popular multimeter are available here. So you can read the details of each product and can choose the best option for you. Each of them has their own specialty and you will feel that the products are available at the cheap prices when compared with the products with the same specification. So I would suggest you that rather than searching here and there select any one item from here and trust me you will get the feel of having the best product.